Among the most interesting and useful of the new "Doctor Who" material now flooding the market is Doctor Who Classic Comics. This monthly from Marvel Comics plans to reprint every "Doctor Who" comic strip story from the 1960s and 1970s. Many of these strips have not been seen in print for over twenty years. Artists have been rendering "Doctor Who" in comic-strip-style art since the shows inception on the BBC in 1963. After the airing of the second full episode, Terry Nations The Daleks, the Doctor became such a sensation that British children clamored for more and more "Doctor Who." Britain had a similar tradition to ours, of turning TV shows into comic books. Unlike in America, where a show might have its own comic book, Britain had more general TV-based comic books that contained strips for several shows in each issue. It was in these multi-media comics that the "Doctor Who" strips ran and from which the new Doctor Who Classic Comics reprints material. Following upon the success of the "New Adventures" novels, Marvel UK began to look for additional "Doctor Who"-based products to tap into the growing market [ See "New Adventures  At Last!" in issue #7 for a discussion of the New Adventures novels]. Marvel wanted a title to complement their excellent monthly Doctor Who Magazine. 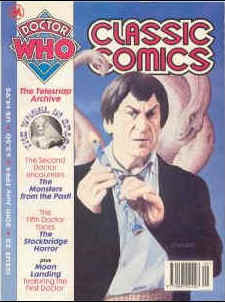 Six issues of Doctor Who Classic Comics are available in the United States. All are definitely worth collecting, not only as prime "Doctor Who" memorabilia, but also as highly entertaining reads. Doctor Who Classic Comics draws from several sources for their comic strip adventures. Original adventures reprinted from the British publication TV Comic feature various Doctors (especially the First, Third, and Fourth). TV Comic, a publication aimed at young children, turned many popular programs on British television into comic strips. TV Comic first began running "Doctor Who" in November 1964. Doctor Who Classic Comics also reprints from another British magazine, Countdown, created in 1971 for older readers. Countdown later became TV Action + Countdown and issued lengthier adventures starring the Third Doctor. It ceased publication in 1973 and the "Doctor Who" strips returned to TV Comic. These strips often have the Doctor accompanied by companions that never appeared in any televised adventures. In the strips, the First Doctor had two human grandchildren, much like Peter Cushings Doctor in the two awful movies from the 1960s. The Fourth Doctor, though, has been accompanied by Sarah Jane Smith in some of his comic strip stories. A series of strips reprinted from TV Century 21 features those most popular "Doctor Who" monsters, the Daleks. Doctor Who Classic Comics are available in the United States at specialty comic shops or by subscription. Each issue contains one or more pull-out posters (often a giant-sized one) and a comprehensive continuing history of "Doctor Who" by British writer John Ainsworth. Doctor Who Classic Comics is one of the finest collectibles Ive seen in a long time. The strips are of varying interest; some of the artwork is excellent, especially for the Third and Fourth Doctor strips. Unfortunately, too many of the original comics were geared toward children. Then, and now, people responsible for Doctor Who make the mistake of pretending it is a show only children watch. Even so, the covers of Doctor Who Classic Comics are terrific, John Ainsworths history is great reading, and enough of the strips and stories are satisfying to make this a must-buy for Who enthusiasts. Many American Whovians choose one or two Doctors (usually the Fourth, sometimes the Third) as their favorites and ignore all others. Some American fans have never seen the early Doctors, since many PBS stations will not broadcast the early black-and-white adventures. (The show was produced in black-and-white until 1970.) Only six episodes of Patrick Troughton, the Second Doctor, are still completely held by the BBC  there was an infamous "purge" of their tape library in 1972. As a result, large numbers of American "Doctor Who" fans do not know or care much about the shows early history. Doctor Who Classic Comics gives us a sense of the earliest days, not only of "Doctor Who" but also of its fandom. Doctor Who Classic Comics is the literary equivalent of a TARDIS, allowing us to travel back in time to revisit the genesis of the Who universe. For anyone with an interest in what our favorite show and the universe it created used to be like, Doctor Who Classic Comics belongs in your library. My next column will be about the lunatic cult British science fiction comedy series "Red Dwarf" and the many collectibles it is now inspiring. Smoke me a kipper, and see you in the next issue!